Last month’s article continued the theme of local government being “the solution” and focused on Pinellas County, a highly-urbanized community with a recently revised strategic plan. To evaluate the plan, one problem was chosen. A recent citizen’s survey identifying “traffic congestion” as a top concern. Traffic congestion, like many social issues, is easier to identify than define. One common method measures “commute time,” the amount of time expended to travel from home to work. The U.S. Census reports that Pinellas County’s commute time was 24.3 minutes. This is actually lower than the national average of 26.1 minutes, leading to the assumption that the problem identified in the survey may not be actual. This is an important concern when formulating public policy where perception can quickly become political reality. As Stephen Covey has stated, “we simply assume that the way we see things is the way they really are.” But looking at “congestion” through a single statistic, drawn from one county, presents a deceptively narrow picture. Another important issue that increases congestion in Pinellas County is its internal land use patterns. Years of random development and growth have compressed their population into a density of 3,347.5 persons per square mile according to the latest U.S. Census. This is high when compared to the national average of 87.4 or Florida at 350.6 persons per square mile. Although high-rise condominiums and apartments can be found with increasing frequency, most dwellings are comprised of single family homes, townhouses or mobile homes. The flatness of its past development patterns are also mirrored in its endless strip malls and commercial establishments that line its roadways, especially along U.S. 19. Richard Reep describes the county in his blog Newgeography.com. 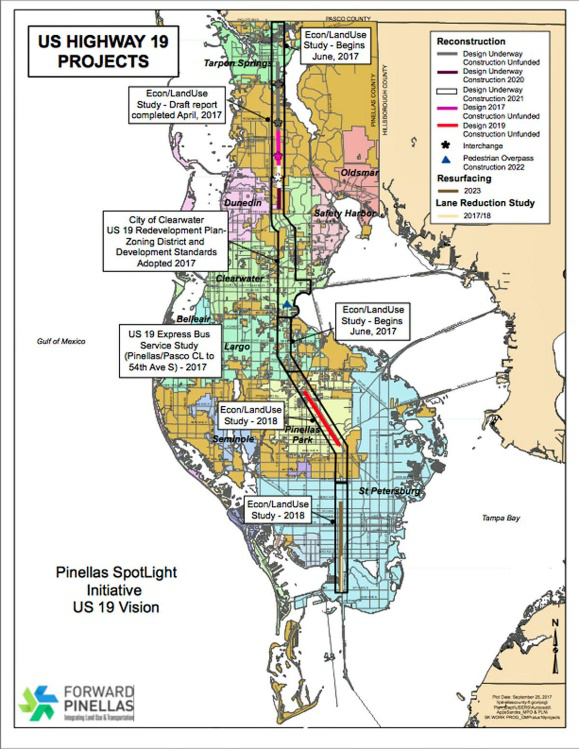 “The residents seemed to have passively accepted the traffic-choked commercial strips …it is a living example of the atrocious results when leaders focus on quantity, not quality.” When viewed through other perspectives, it is not surprising that Pinellas County residents see traffic congestion as a top concern. According to Charles Kettering, “a problem well stated is half solved.” But what about the other part of this equation, the remaining half that requires planning and action? In the perfect world, the most effective method would halt development until the capacity of the county’s transportation network was expanded. This would afford the time needed to analyze the problem in detail, develop solutions within their strategic plan and assemble required resources for resolution. However, this is simply not practical in the real world. Although counties are allowed to enact development moratoriums, the criteria is narrow and the timeframes are short. Even if one were enacted, the political and legal pressures applied from the numerous vested interests would be overwhelming. In America, our militant adhesion to property rights, embedded in our Constitution, would quickly prevail. In addition, Clearwater, one of the county’s 24 cities, has completed and is implementing its Clearwater U.S. 19 Corridor Redevelopment Plan. Objectives include “an implementable vision to strengthen the identity, design, mobility, and competitiveness of the corridor in the region.” But how these and other plans address the critical problem of congestion, especially along U.S. 19, will depend on several specific steps. This is the focus of next month’s concluding article.